This past weekend I was in attendance at Queen City Conquest in Buffalo, New York; this is the show's fifth year, I believe, and my second year in attendance. This year, like last year, I was there for Saturday only; and again, I ran two Call of Cthulhu sessions more or less back to back, with a dinner break in between. I'm not going to do detailed write-ups of how the sessions went, because by the end of the second one I'd been awake for going on 20 hours and they're already getting a bit fuzzy to me; instead, I'll do a write up of my overall con experience. Our story begins with me stopping in at Wegman's, my local grocery chain, to buy snacks to distribute. When I'm running a game, I see myself as host and my players as guests, regardless of venue, and I think it's a nice gesture to provide snacks. My plan was to hit up the bulk candy aisle and fill up a bag with gummi candy octopuses; what could be more appropriate for Cthulhu, yes? I get to the bulk candy aisle, and there's two sorority girls (they were wearing Greek letters; honestly, I'm at the point where everybody under the age of 25 looks like they're 12 to me) emptying the gummi octopus bin into a bag. Girls, there is nothing you need those gummi octopuses for more than I need them, okay? So casting about, I grab two packages of Halloween Oreo cookies. This will do. The drive in is uneventful; I drive past the Buffalo Convention Center where the convention is being held, heading for the nearest parking lot. I pull in, and am told by the attendant, "Sorry, the last spot just filled, you'll have to find someplace else to park." Pull into the next lot; the attendant says it's $5, cash only, to park. I don't have cash on me. He says, "Whatever, just park there anyways. They aren't paying me enough to care." So I ended up with free parking for the event. Queen City Conquest is not a huge convention, but it feels big to me. I think about 400 people go through the door over the course of the weekend. This year, QCC was sharing the Buffalo Convention Center with some sort of crossfit/gym-junkie convention, which was pretty funny to me. Both my sessions this time around were run under the banner of Rogue Cthulhu, an organization based out of Ohio that organizes convention games of Call of Cthulhu; my friends Rich and Heather, who have been playing in my games at Running GAGG pretty consistently for years, are working to expand Rogue Cthulhu into the Western New York region, beginning with this year's Queen City Conquest, and I was more than happy to work with them on this. For my first game, from 1pm to 5pm, I ran The Derelict again, Chaosium's Free RPG Day 2016 offering. Having discussed the adventure not too long ago with Sean, one of my regular players who also GMs occasionally, we hit on something that had felt off to me previously; the monster in the scenario carries a gigantic bow and arrows of unknown manufacture, which doesn't feel very Mythos-y to me. 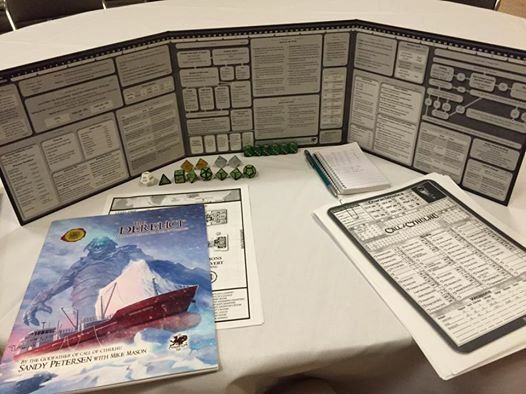 Additionally, the pregenerated characters provided with the PDF of the scenario have some elements to them that don't quite work with the scenario as written - they've all got military connections and guns, for starters, but the thing that's been a thorn in my side is a note in one character's background - that they were told the derelict freighter would be there, and that they should retrieve the contents of the captain's safe. There is no reference to a safe in the scenario, much less mysterious contents. 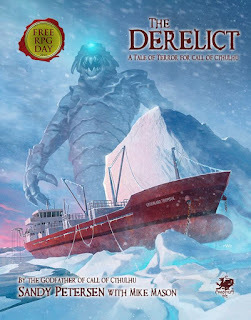 So I decided to do some rewriting, to revise the monster, tie the scenario in more strongly to the semi-connected "Cthulhu Mythos" of the RPG, and create an interesting something in the captain's safe. After playing around with various slug- and worm-like ideas in my sketchbook, I came up with a revised monster that I felt confident in - a fat, wattled worm-creature that dragged itself along on two stubby, webbed arms with a one-eyed, slug-like face and a tongue it could project like a chameleon's, only tipped in a sharp barb; this would replace the bow and arrow as the creature's primary weapon. I tied this creature in to Lovecraft's short story "The Temple," and more specifically to "Gloon," a worm-like entity with a strange connection to certain Greek-style statues; Gloon is, as far as I know, wholly a creation of the RPG. I placed a Gloon-connected piece of statuary in the captain's safe, noted in the captain's log (which the investigators in this case never got a chance to read) the statue's origin, and sent the creature to retrieve the statue and kill the unbelievers handling it. straight to the radio room upon boarding the derelict freighter, rather than explore as they went, so the creature slept through a good portion of the scenario before rousing itself to menace them; the players worked themselves up over finding the mangled remains of crewmembers and damage to the ship's controls and radio room, desperately trying to figure out what had happened. They did retrieve the statue, having visions of Atlantis as they handled it, which woke the monster up from it's post-binge eating nap in the hold. Ultimately, the creature killed four of the six investigators; one got impaled through the chest on the tongue-tentacle, the second survived an impalement through the thigh only to be killed when another investigator dropped a molotov cocktail on them; the third got impaled through the head, and the fourth, now obsessed with the strange statue, was dragged under water and drowned when he refused to release his hold on it. We had one new player and three who had played in one of my games at last year's QCC; two scheduled players weren't able to make it but Rich and Heather were able to jump in. I really liked the changes I made, and while the characters never learned the origin of the statue or the monster, at least one of the players looked at me and went, "This is from Lovecraft's 'The Temple,' isn't it?" so the connection was not lost. I had dinner with my sister and her boyfriend at the Pearl Street Grill, a short walk from the convention center, and I'm pretty sure I had the same thing I had last year - a bacon cheeseburger topped with onion rings, cooked medium, side of fries. Below the Pearl Street Grill is a wonderful little place called Brawler's Deli - I was treated to lunch there by my coworkers the day I left my job at HSBC bank, the day before I moved to Rochester. Giant, meat-filled sandwiches. Unfortunately they're closed on weekends, otherwise I would have insisted on a pastrami on rye from Brawler's. But I digress. On the way back from dinner, I stopped at my car and grabbed the Oreos, which I forgot to bring in when I brought all my game stuff; as such, I placed one package of Oreos on my table, and one the next table over, where Heather was running a very dark, somber WWII-era Call of Cthulhu scenario. This was quite a contrast from my 7pm adventure, "The Haunting of De Morcey House," which began life as an attempt to update the classic scenario "The Haunting" to the modern day. I used a team of fraudulent TV ghost-hunters as investigators, brought in elements from M.R. James' short stories "The Treasure of Abbot Thomas" and "The Casting of the Runes," and replaced the lich in the basement with a Crawling One, a wizard's personality and intellect transferred to the worms that ate his corpse. Finally, I brought in a few touches from an episode of the TV show "Supernatural," specifically one dealing with the "Ghost-Facers," a group of inept ghost hunters trying to get a TV deal. Two of my players from the earlier session returned for this one, and I think the other four players were either completely new to Call of Cthulhu or hadn't played it in years. It ended up being a fairly light-hearted scenario, even as they were attacked by swarms of rats and pelted with exploding china cabinets. Sanity was nickel-and-dimed away by so many "small" events, and then the final reveal when the Crawling One boiled up out of the ground, plus the discovery of a crystalline idol of the Great Old One Yibb-Tstll, really cracked some brains. The Crawling One blasted two investigators out of existence with castings of the Shrivelling spell, and a third player, having lost almost half his sanity in one failed roll after being granted a vision of Yibb-Tstll in the flesh, woke up three days later, two towns over with no memory of who he was or how he got there. As an added bonus, one of the new players had recently taken a cryptography and code-breaking class - and so when they discovered the coded message hidden in the stained glass window, he was able to solve the code without needing me to give any help. An unexpected use for a class he took as an elective, to be sure. Both scenarios basically took of their entire time slots, which took me by surprise; I had anticipated them both running about three hours, but The Derelict ran for three hours and thirty-seven minutes, while The Haunting of De Morcey House ran three hours and fifty minutes. I didn't end up buying anything at any of the vendor tables at QCC this year - nothing really jumped out at me, and I didn't want to buy something just for the sake of buying something. I was surprised to see no miniatures for sale anywhere - one vendor had a couple boxes of ships for the "X-Wing" fleet battles game, but that was it. I did get a T-shirt with the con logo on it, but I'm not sure I'll get to wear it - I think Gina has already declared it "soft" and thus claimed it. The drive home wasn't too bad, but I definitely wasn't caffeinated enough - next year I either need to not do an evening game or make arrangements to spend the night in Buffalo, but I'm not sure I was really good to drive home - my eyelids were dangerously heavy. But overall it was a good show and I'm looking forward to next year's show.